There are 2 ferry routes operating between Faial and Pico offering you combined total of 64 sailings per week. Atlanticoline operates 2 routes, Horta to Sao Roque runs 15 times per week & Horta to Madalena about 7 times daily. As the frequency and duration of crossings on some routes varies we would advise that you do a live search for crossings from Faial to Pico to get the most up to date information. 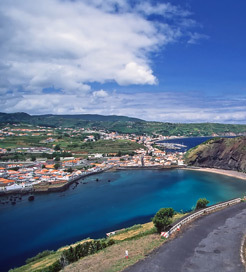 Faial is part of the Central Group in the Azores, a Portuguese archipelago in the North Atlantic Ocean. The coastline has some beautiful volcanic beaches, whilst the western shoreline has dramatic cliffs plunging into the bright blue ocean. Out on the seas, you can enjoy a wide range of activities like windsurfing, kayaking, diving and whale watching. The inland is dominated by an enormous crater which was the location of the most recent major volcanic activity in the Azores, adding roughly 1 kilometre to the landmass in 1957. You can even traverse the scenic, hilly terrain on mountain bikes or on a guided 4x4 SUV tour. From the vibrant port town of Horta on the southeast coast, you can choose from a wide range of sailings to most islands in the Azores. Given the archipelago is spread sparsely in the North Atlantic, the journey times to each island can vary considerably. Pico is a large island in the Central Group of the Azores, a Portuguese archipelago in the heart of the North Atlantic Ocean. 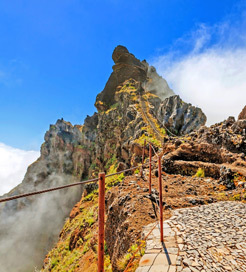 With its formidable, albeit dormant, namesake volcano commanding the horizon, Pico’s grand landscape offers some of the best hiking and climbing in the Azores. The ever changing scenery makes for some gorgeous backdrops, with brightly coloured exotic plants giving way to vast lava rock formations and enticing, natural swimming holes, offering unforgettable walks and bike rides. Pico also has a rich history and deep-rooted links to the whaling industry, ever since it was discovered in the mid-fifteenth century, while boasting a long-standing fine wine culture, with its unique vineyard landscape commended by UNESCO in 2004. As part of the Central Group, Pico is well linked to the majority of islands in the archipelago by ferry, with vessels docking in the town of Sao Roque on the north coast.